Rob Williams' Suicide Squad has had highs and lows, but when it works, it really works. Suicide Squad Vol. 6: The Secret History of Task Force X is a case in point; though not the strongest in every aspect, after twenty-five issues the stories seem to flow so effortlessly and Williams has developed such a rapport with these characters that picking up the newest volume of Suicide Squad is eminently comforting. 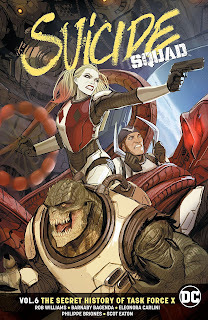 Blending DC Comics history with modern Suicide Squad mayhem, Secret History demonstrates how far Suicide Squad has come through sheer dogged workmanship. It remains a brilliant choice to have ever put Harley Quinn in Suicide Squad, the two having become synonymous, and almost as always, this volume is really Harley's show. Williams writes Harley the perfect combination of madcap and brilliant; when she's wracking the Dr. Quinzel side of her brain for a solution to combat the alien monster, it demonstrates Williams' understanding of all the sides of this character that others might write as one-note. I thought the Harley Quinn/Rick Flag romance was a silly idea until Williams made me a believer (and then tossed Rick into the Phantom Zone); he toys with that in all sorts of wonderful ways in this volume as Harley meets Rick's grandfather and then later deals with her complicated feelings over Rick's return by pushing him away. The backup stories are back in this volume, after they worked so well in some of Williams previous Squad books. They're just two pages each, but I sincerely think the truncated space (both the eighteen for the main story and the two for the backup) benefits both products immensely. Those backups are slick and smooth slices of yesteryear starring King Faraday, drawn by Wilfredo Torres with shades of Darwyn Cooke. Faraday has a history with Suicide Squad iterations past, and Williams' use of him here is a nice touch, in line with the appearances of Rick Flag the elder, Karin Grace, and the Red Wave monster. Williams has done well in having elements in this series reoccur (Zod, for one, and also the Russian Suicide Squad); I very much hope that, with Faraday now imprisoned in Amanda Waller's Belle Reeve, Williams intends to make him part of the cast, a capable spy foil for "the Wall." Williams' other Squad members are at times just window dressing; Captain Boomerang, specifically, mainly just provides whiny comic relief and not much else, though Williams-via-Boomerang's references to alien movies past and present are sufficiently funny. Deadshot, for instance, disappears after a while, though I know we've got some Deadshot material coming up in a volume or two. The work however that Williams has done with the title's other unlikely couple, Killer Croc and Enchantress, is good, and it's handled very subtly until the end, when Croc's sacrifice ruins their good momentum. Again, smart work by Williams, making us care about these characters not by overemphasizing them but by going back to the well every now and then until we're on board as a matter of course. With the exception of Torres, the art in this volume is not particularly strong. Across six issues, there are four artists (problematic at the outset) -- Barnaby Bagenda, Eleonora Carlini, Philippe Briones, and Scot Eaton. Among these, the book starts with really not enough detail, faces just kind of sketched on in far perspective shots and with non-focus characters sometimes staring off into space. Later, the book gets hyper-detailed, not bad but very much beholden to DC's house style where everyone's built with the same proportions. It is frankly a testament to how on it Williams is with this volume, or how familiar his take on these characters has become, that the book is as good as it is without strong art support. In Suicide Squad Vol. 6: The Secret History of Task Force X, Rob Williams has a callback to his very first Suicide Squad volume -- Killer Croc vomits in his space helmet again, which was silly and irreverent in that strangely cut, awkward first Rebirth volume, and over twenty-five issues later is now hilarious in the redo. Such is how far Williams' Suicide Squad has come, and amazingly after just twenty-plus issues -- the Rebirth Suicide Squad feels just as fully realized as Batman or another title, and with only half the issues. This title has had a bumpy ride but it feels like it's hitting its stride.